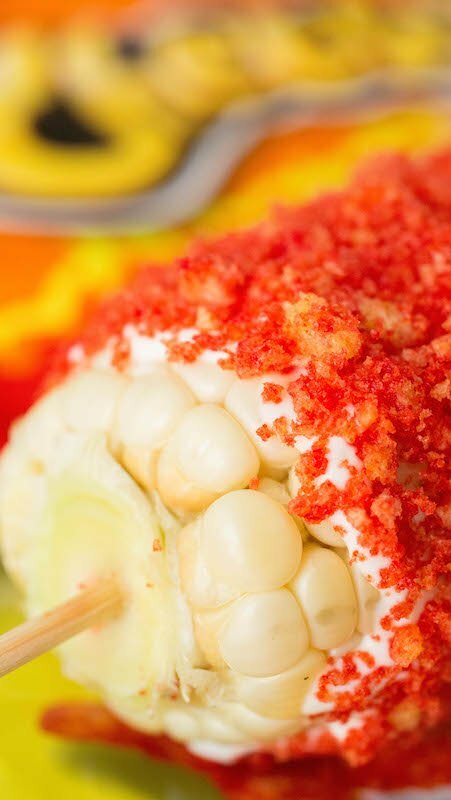 This recipe takes classic mexican street corn (elote) and gives it a twist by using Flamin’ Hot Cheetos in place of the chili powder. If you live in Southern California you are probably familiar with elote, or “Mexican street corn”. It is that delicious corn the man on the street corner grills, then covers in a creamy sauce mixture and finishes off with lime and chili powder. If you’ve had it you know it is simply divine. 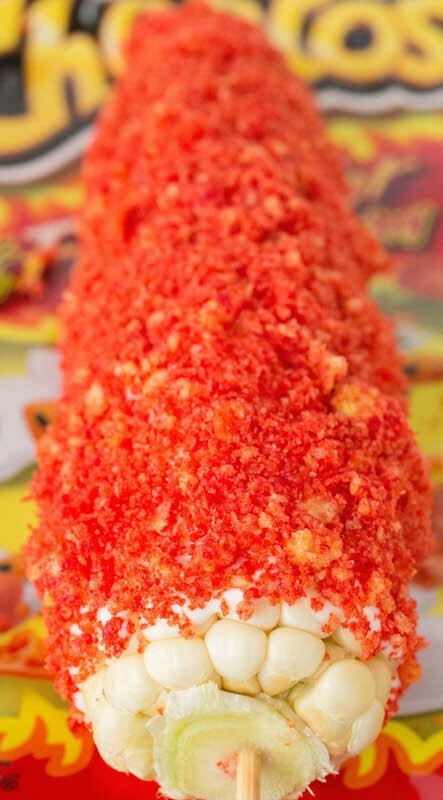 A fro-yo place here in California has been serving up a new version of street corn that is covered in Flamin’ Hot Cheetos. It may sound crazy, but I’m telling you, it is nirvana inducing! And people can not get enough of it. They’ve become so popular that the line is often two hours long! Maybe you’re drooling over the thought of “Cheelote” (Cheetos = elote = Cheelote….it’s just basic math, people!) but aren’t in California. Or maybe, like me, you are in California but way too lazy to stand in a line for two hours. No worries, I’ve got you covered! I’ll show you how to make your own Flamin’ Hot Cheetos corn on the cob at home. Remove the husks and silk from your corn. Rinse under cold water. Place a skewer in the bottom of the corn for easy handling. Grill the corn 8-10 minutes over medium-high heat. Rotate often. In a bowl, combine the mayo, crema, and minced garlic. Use a spatula and cover each corn. Place your Flamin’ Hot Cheetos in a Ziploc bag. Turn into crumbs by beating with a mallet or rolling pin. 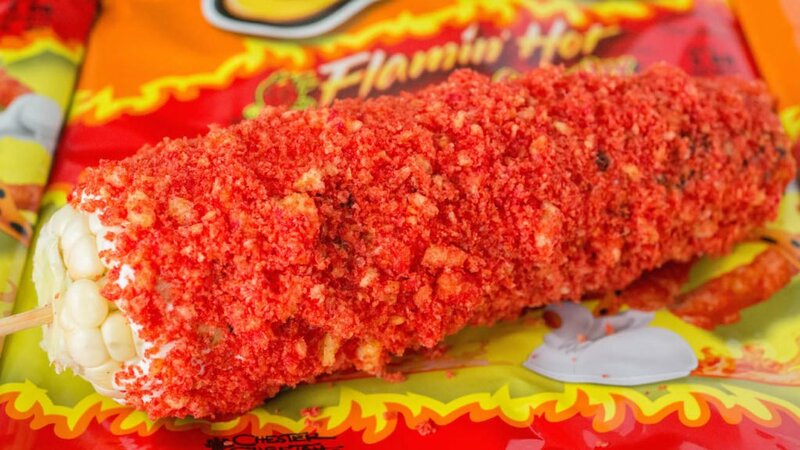 Cover each corn in the Flamin’ Hot Cheetos Crumbs. You can gently pat it on to ensure it stays put. This is so colorful and I lOVE Cheetos! Maybe even a little too much. This is going to be fun to make with my daughter. Thanks for this!